Mobile isn’t just for finding local merchants to start the shopping experience. Recent data from Google shows mobile is a shopping companion while consumers are in the store looking to buy. In a new study, “Mobile In-Store Research: How in-store shoppers are using mobile devices,” Google showcases consumer behavior while they shop. According to the data, 84 percent of smartphone shoppers use their devices to help shop while in the store. Google also found that in-store mobile activity begins with search, rather than with shopping apps or navigating directly to brand/retail websites. Eighty-two percent of smartphone shoppers use mobile search to help make purchase decisions, Google reports. This aligns nicely with all the data we’ve been seeing lately on how mobile drives user behavior online. Earlier this month, we learned that local search via non-PC devices more than quadrupled in 2012, according to a study by the Local Search Association. We also saw data from Telmetrics and xAd that showed 46 percent of searchers now use mobile exclusively to research. But what we haven’t seen yet is new data on how people use mobile while they shop, until now. Let’s take a look at some key stats from the Google study. 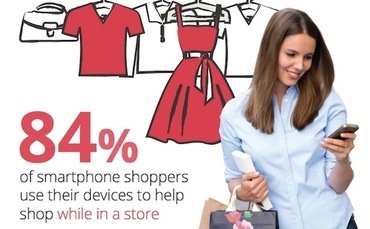 First, how many shoppers actually use their phone to assist in the shopping experience while in the store? Mobile can be used to keep people in the store. Mobile can meet the “showrooming challenge” head on.